The most frustrating bird today was a large Shearwater seen off Marine Drive at 08.40 flying south. 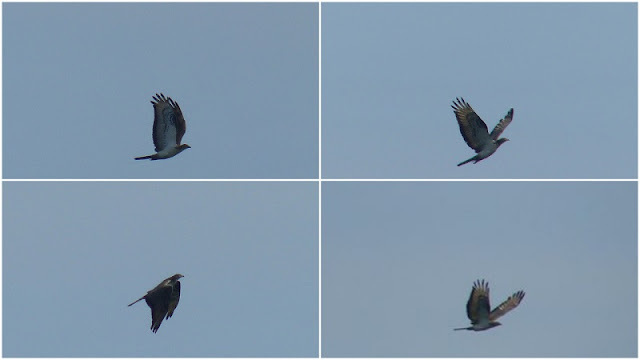 Unfortunately the bird was picked up a little late and was only observed looking into the sun, the flight action and wing posture suggested Cory’s but it just wasn’t conclusive enough. Also moving on the sea off Long Nab some southbound waders including 2 Sanderling, 57 Dunlin, 8 Redshanks, 35 Oystercatchers and 4 Curlew (6 went north) plus 33 Common Scoter (15 S, 18 N), Red-throated Diver (2 N), Manx Shearwater (2 S, 10 N), Sandwich Tern (5 N), Common Tern (2 N), 9 Puffin (7 S, 2 N), Swift (14 S) and 2 Sand Martin (S). At Potter Brompton Carr we had 3 Green Sandpipers, 2 Teal and a reeling Grasshopper Warbler; a ♂ Honey Buzzard was observed from Wykeham Raptor View Point at 11.55; there were 4 Mediterranean Gulls at Holbeck (3adults and a second calendar year bird) and 2 Whimbrel went south past Marine Drive.